Our beef, pork, veal, lamb and sausages are all sourced exclusively from Herrmann Landwerkstätten, located near Glonn, the whole operation is a perfect example of the most natural, biological and species-appropriate animal husbandry. In particular, we recommend our pork, which is freshly made daily from the Schwäbisch-Hällischen, country pig. You can enjoy the taste with a clean conscience! The fishing and fish farm Sebald is located in Ammerland (Münsing) on Lake Starnberg, it is a family owned business. They have been members of the fishing cooperative Würmsee for generations, this ensures that the fish population of Lake Starnberg (formerly Würmsee) is maintained and protected, therefore ensuring sustainable ecological and economic activity. It also encourages the continuation of the old family farms. Membership is very hard to gain it is only provided to fishing masters who meet with the strict requirements. Our native fish species such as Whitefish, lake Trout and Char ( a fish very similar to trout or salmon ) are healthy and extremely tasty food. Fish is an important part of a nutritious diet, because it provides us with high-quality protein, healthy fats, vitamins, essential minerals and important trace elements. The natural life cycle of the fish, depends on the seasons, so to ensure the continuity of the conservation of all the species it means not all fish are constantly available. For example in October and November there is no fresh whitefish. In Klinglwirt there is always a fish dish on the set menu as well as 1 – 2 times per week on the daily menu, usually every Friday. In the beautiful area of “Bairer Winkl”, located in the extreme south of the Ebersberger district (which, incidentally is where the “old” Klinglwirt was started ) is the Stroblberger yard. It is owned and run by the family Neuner, who use only organic farming methods as prescribed by the Naturland Association. The dairy cows at Stroblberger have a spacious open barn with straw bedding and are free during the summer, to wander at all times on the pasture. Due to the high percentage of meadow grass in their feed, the milk is particularly rich in omega-3 fatty acid (1.5g / 100g fat). For the production of cheese all the necessary ingredients, such as rennet, sea salt, white mold cultures and herbs are all organically produced. 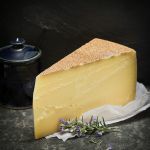 The cheeses are matured in centuries-old vaulted cellars until they develop their optimum taste, the old mountain cheese can take up to 15 months to mature fully. We use cheese from Stroblberger yard for our snack Brettl, the cheese platter and of course for our popular spinach cheese noodles with caramalised onions. Must try! Our organic farm bread is provided by the Holzofen Bakery ( based east of Munich) the owner is Martin Schmitt. The bread they bake is based on a natural sour dough recipe and contains no additives. The flour used comes exclusively from organically grown grain. Cramer in Gauting produces organic ice cream, which can be found on our dessert menu. As organic-certified Ice cream makers Cramer’s ice creams have wonderful flavour and are produced ecologically, to the highest standards. In the beautiful “Bairer Winkl”, located in the extreme south of the Ebersberger district (which, incidentally is where the “old” Klinglwirt was started), there is the family run farm of Hans and Gitti Riedl, their farm is called “Zehatmoarhof”. It is from Zehatmoarhof that we source our eggs and it is these eggs we use to make our popular eggnog. The eggs from Zehatmoarhof come from free-range chickens that are fed exclusively with soy, wheat and oats grown by the farmers themselves and their feed is completely GMO-free. Everything is subjected to the stringent control of experts from “Our Country” and the guidelines they set out. The high quality of the eggs is achieved because the animals are healthy and feel good, each chicken at Zehatmoarhof has about a 4 sqm outdoor area to themselves. Fresh straw and wood chippings are laid down in the coop, which means the chickens can follow their natural instinct, scratching and pecking to their hearts content. Try the eggnog in Klinglwirt or our popular spinach Käsespätzle that we produce using the wonderful eggs from Zehatmoarhof. The Löwenbräu-Aktiengesellschaft is one of the oldest breweries in Munich. Around the turn of the century Löwenbräu was the largest brewery in Germany, which has been achieved due to its high turnover from exports. The beer from Löwenbräu is prepared according to traditional recipes, using the latest brewing technology and strictly according to the Bavarian Purity Law. We especially recommend the Löwenbräu archetype, which is characterized by a balanced spiciness, a golden color and a delicate taste. The history of the oldest bourgeois brewery can be traced back to 1363. The name is derived from a Franciscan monastery, the original brewery was located near the monastery. The best-known beer of Franziskaner Weissbier first appeared on the market in 1974 under the name of Franziskaner Hefe-Weißbier. The wheat beer is a top-fermented beer that is brewed true to the purity law of 1516. We serve this beer fresh from the taps, light or dark, small 0.3 litre or the classic 0.5-litre glass. We especially recommend the Franciscan Royal vintage wheat beer, which this year is a little stronger (6.1% vol.). It has a reddish-orange hue and a delicate tangy hop aroma.